Did you hear the one about the new black Barbies? 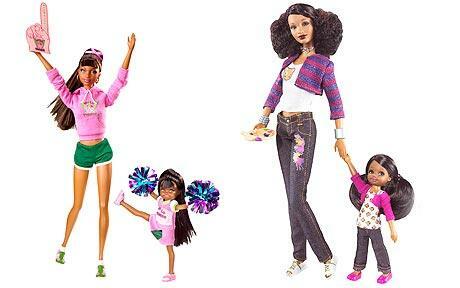 When I heard of them, I remember thinking…in a different world, some Barbies, maybe all Barbies, would have afros. Yes, afros. And instead of brushes, they would all come with comb picks. The bigger you could pick your Barbie’s afro, the cooler and more loved it would be. And what would these have Barbies taught little girls like me? Check out: The line the new black Barbies won’t cross and “Not all girls embrace latest black Barbie doll, say Mattel toys went too far with rap-detail.